Honey bee queen fighting occurs when there is two or more queens in one nest (temporary polygyny). As a result of the fighting there is only one queen left in the nest (monogyny). The fighting can occur during swarming, emergency queen rearing and possibly supersedure. In the fighting usually participate young virgin queens but during supersedure young virgin queen can fight with old mated queen. In experimental conditions also mated queens can fight . There are also fights between queens and pseudoqueens . The queen fighting behaviour is induced by olfactory stimulus , source of the stimulus is located on abdominal tergites  and it is not related to mandibular glands . Queens are able to perceive each other only when there is direct contact between them . Sometimes short contact between two young queens does not end with fight . In A. m. sicula young virgin queens can tolerate each other for some time . Queens refrain from fighting when one of their mandibles was removed . During the fight queens use sting while holding each other with legs and mandibles . The queen which successfully stung its rival wins the fight. Sting is usually delivered into intersegmental membrane of abdomen. The fight last from 5 seconds to 15 minutes . In most cases stung queen is paralysed and dies within about 15 minutes. The stung queen can be immobilized by workers  and before death it can receive from the winning queen additional stings . The winning queen is usually not injured. Occasional her wings can be destroyed during fighting . In case of virgin queens older individuals win the fights more often , but in case of mated queens the opposite is true . During swarming the oldest queen have advantage only in colonies without afterswarms . Heavier queens won the fights more often in one study  but not in others . There are suggestions that workers can affect result of the fighting . Young queens are harassed by workers. A behaviour called "clump" occurs when a worker close her mandibles on leg or wing base of a queen . Another behaviour called "grab" occurs when a workers opens and closes her mandibles against the surface of thorax and abdomen of a queen . However, workers do not participate in the queen fighting by stinging the queens . Queens that were vibrated by workers at higher rates won more fights . Harassment of a queen by a worker is not affected by their relatedness  or queen quality . During the fight content of hind-gut (see queen faeces) can be released by one or both queens . This behaviour (called spraying) occurs in 67%  or 38%  of fights. After the spraying the fight is usually interrupted and queens are separated . The queen covered with faeces is often immobilized by workers  for 15±24 minutes . Queens that were immobilized in this way are less likely to survive the fighting . Sometimes immobilized queen is attacked and stung by free moving queen . Spraying is specific to young queens up to two weeks of age . Butz V.M., Dietz A. 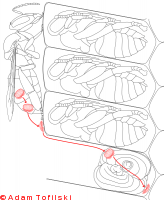 (1994) The mechanism of queen elimination in two-queen honey bee (Apis mellifera L.) colonies. Journal of Apicultural Research 33:87-94. Moritz R.F.A., Pflugfelder J., Crewe R.M. (2003) Lethal fighting between honeybee queens and parasitic workers (Apis mellifera). Naturwissenschaften 90:378–381. Riedel S.M., Blum M.S. (1972) Rapid adaptation by paired queens of the honey bee, Apis mellifera. Annals of the Entomological Society of America 65:825–829. Velthuis H.H.W. (1967) On abdominal pheromones in the queen honey bee., XXI International Beekeeping Congress, College Park, USA, pp. 58–59. Pflugfelder J., Koeniger N. (2003) Fight between virgin queens (Apis mellifera) is initiated by contact to the dorsal abdominal surface. Apidologie 34:249–256. Szabo T.I., Smith M.V. (1972) Behavioural studies on queen introduction in honeybees. 5. Behavioural relationship between pairs of queens without worker attendance. Proceedings of the Entomological Society of Ontario 103:87-96. Tiemann K. (1996) Zum Schwarmverhalten der sizilianischen Honigbiene (Apis mellifera sicula). PhD thesis, Universität Bremen, Bremen. Gilley D.C. (2001) The behavior of honeybees (Apis mellifera ligustica) during queen duels. Ethology 107:1-22. Tiemann K., Brückner D., Schmidt-Unlenkamp H. (1991) The biology of the Sicilian honeybee (Apis mellifera sicula). Apidologie 22:477-479. Tiemann K., Brückner D. (1993) Zum Schwarmverhalten der Sizilianischen Honigbiene Apis mellifera sicula (Montagano 1911). Apidologie 24:365–374. Dietemann V., Zheng H.Q., Hepburn C., Hepburn H.R., Jin S.H., Crewe R.M., Radloff S.E., Hu F.L., Pirk C.W.W. (2008) Self assessment in insects: honeybee queens know their own strength. PLoS One 3:1412. Dzierzon J. (1898) Widerlegung der jüngst gegen meine Theorie der Fortpflanzung der Bienen erhobene Einwände. Bienenzeitung 54:299-302. Tarpy D.R., Hatch S., Fletcher D.J.C. (2000) The influence of queen age and quality during queen replacement in honeybee colonies. Animal Behaviour 59:97–101. Schneider S.S., DeGrandi-Hoffman G. (2008) Queen replacement in African and European honey bee colonies with and without afterswarms. Insectes Sociaux 55:79–85. Tarpy D.R., Mayer M.K. (2009) The effects of size and reproductive quality on the outcomes of duels between honey bee queens (Apis mellifera L.). Ethology Ecology and Evolution 21:147–153. Schneider S.S., Leamy L.J., Lewis L.A., DeGrandi-Hoffman G. (2003) The influence of hybridization between African and European honeybees, Apis mellifera, on asymmetries in wing size and shape. 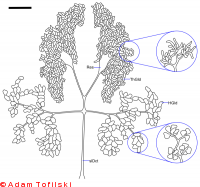 Evolution 57:2350–2364. Page R.E., Erickson E.H. (1986) Kin recognition and virgin queen acceptance by worker honey bees (Apis mellifera L.). Animal Behaviour 34:1061–1069. Tarpy D.R., Fletcher D.J.C. (1998) Effects of relatedness on queen competition within honey bee colonies. Animal Behaviour 55:537–543. Tarpy D.R., Gilley D.C., Seeley T.D. (2004) Levels of selection in a social insect: a review of conflict and cooperation during honey bee (Apis mellifera) queen replacement. Behavioral Ecology and Sociobiology 55:513–523. Schneider S.S., Painter-Kurt S., DeGrandi-Hoffman G. (2001) The role of the vibration signal during queen competition in colonies of the honeybee, Apis mellifera. Animal Behaviour 61:1173–1180. Gilley D.C. (2003) Absence of nepotism in the harassment of duelling queens by honeybee workers. Proceedings of the Royal Society of London. Series B: Biological Sciences 270:2045–2049. Gilley D.C., Tarpy D.R., Land B.B. (2003) Effect of queen quality on interactions between workers and dueling queens in honeybee (Apis mellifera L.) colonies. Behavioral Ecology and Sociobiology 55:190–196. Tarpy D.R., Fletcher D.J.C. (2003) “Spraying” Behavior During Queen Competition in Honey Bees. Journal of Insect Behavior 16:425–437. Bernasconi G., Ratnieks F.L.W., Rand E. (2000) Effect of" spraying" by fighting honey bee queens (Apis mellifera L.) on the temporal structure of fights. Insectes Sociaux 47:21–26. Post D.C., Page R.E., Erickson E.H. (1987) Honeybee (Apis mellifera L.) queen feces: source of a pheromone that repels worker bees. Journal of Chemical Ecology 13:583–591. Réaumur de R.A. (1741) Mémoire pour servir à l’histoire des insectes. Imprimerie Royale 5:207-728. Huber F. (1792) Nouvelles observations sur les abeilles. Barde, Manget et Compagnie, Genève, pp. 368. Darwin C.R. (1859) On the origin of species by means of natural selection, or the preservation of favoured races in the struggle for life. John Murray, London. Davis J.L. (1908) Queen killed by rival. Gleanings in Bee Culture 36:1259–1260. Lensky Y., Darchen R., Levy R. (1970) L’agressivité des reines entre-elles et des ouvrières vis-à-vis des reines lors de la création des sociétés polygynes d’Apis mellifera L. Rev. Comp. Anim 4:50–62. Paleolog J. (2009) Honeybee queen docility noticed during queen duels. Journal of Apicultural Science 53:97-104.